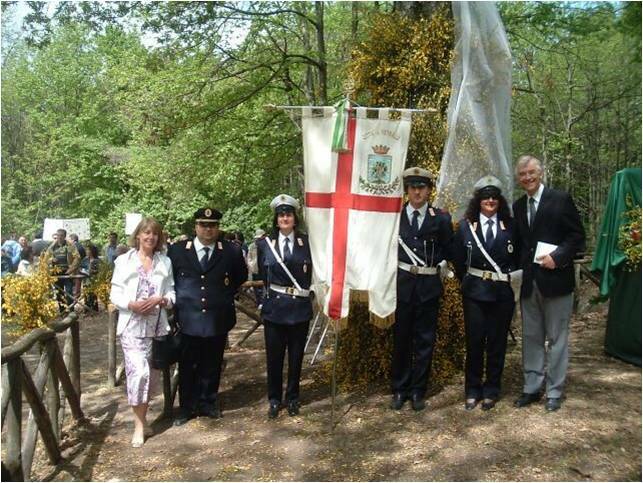 On May 8th each year since 1432 the town of Vetralla, 68 kms north of Rome along the Via Cassia, celebrates the Wedding of the Trees, making it probably the first and most genuine festa ecologica (green or environmental celebration). Costumed dancers cavort to the music of the town band, flag throwers perform and horsemen bearing bouquets of yellow Scotch Broom gallop around the clearing in the forest atop Monte Fogliano. After these opening acts, the Mayor in his tri-color sash performs the symbolic “wedding” between two giant oaks that are decorated with veils and flower garlands. For officialdom’s sake, a notary’s act attesting the union is read and signed by those present. Who is invited to this unusual, historic wedding? 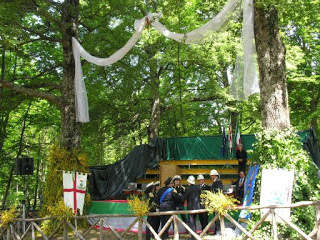 On the grandstand under the giant oaks there are the town officials, some VIP guests, the Passionist priests who live in the neighboring monastery and a spattering of foreign visitors, all enjoying this authentic ceremony which reassert the town’s possession – and protection – of the local forests. Only once, in 1944, was the ceremony cancelled. Due to the Sant’Angelo Monastery’s position dominating the surrounding territory, it was being used as headquarters for the German command and therefore people were forbidden to go near it. For more on this unique festival see Festivals of Fertility on 50yearsinItaly blog.